Some pics of my just finished rig, some mistakes were made, some parts were damaged, next time I am aiming for perfection(no more letting the cat knock my case off a table!). Gonna get some pics of it lit up when I get back from work, I ended up sanding my LEDs to give a more diffuse look to the light, very pleased with the way it turned out actually. Very nice build! Awesome sleeve work too! new rig figured i post pics. nothing special compared to sum of the pcs on this thread. Some help from sadasius on the loop thanks. 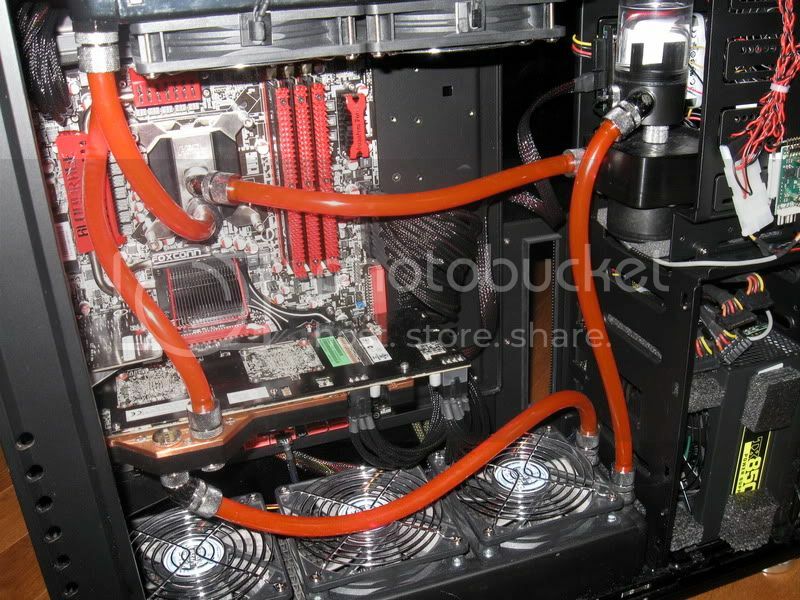 Dual rad setup one loop. 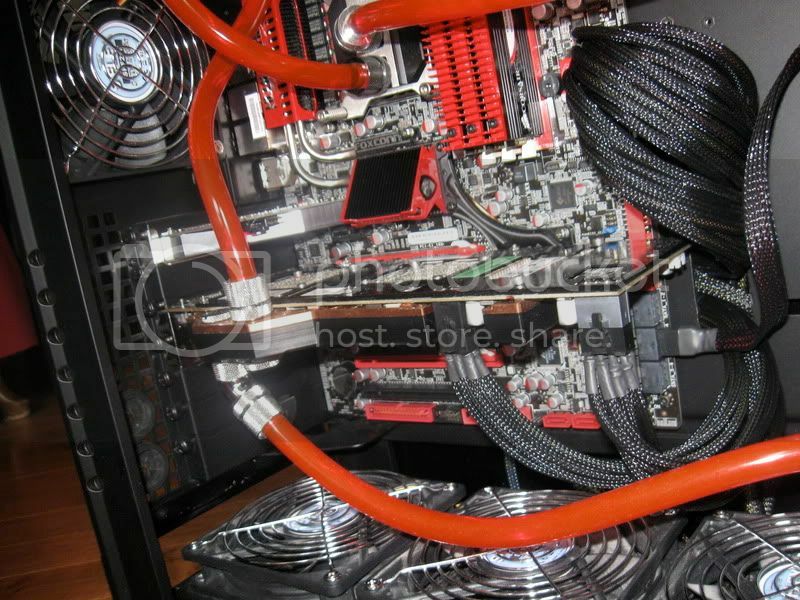 mcr320 and mcr220 mcp655, swiftech 7/16 hose 1/2 barb, bitspower nb/sb apogee gtz, koolance waterblock swiftech res. q6600@3.2 ,780iftw,8gb corsair xms6400, gtx275,corsair 1000hx. 2 640gb hds 2 cdroms.sunbeam fan controller. Last edited by jusdrink; June 21, 2009 at 01:13 PM. @jusdrink, What triple rad is that? I'm guessing you got it mounted on the inside. I wanna WC my cosmos S! swiftech mcr320.it fit perfect. i seen a few others that installed with no problems . ive also seen the rx360 installed inside without any mod. 120x25mm fans will also fit inside and i put 2 fans on top with alil cutout of plastic. it slopes down towards the back so i would like to install another 120 fan jus have to go with a smaller thickness. Last edited by jusdrink; June 23, 2009 at 06:08 AM. Couple of new additions, 720be and a 275GTX.